I’ve been playing a bunch of Fork combo lately. 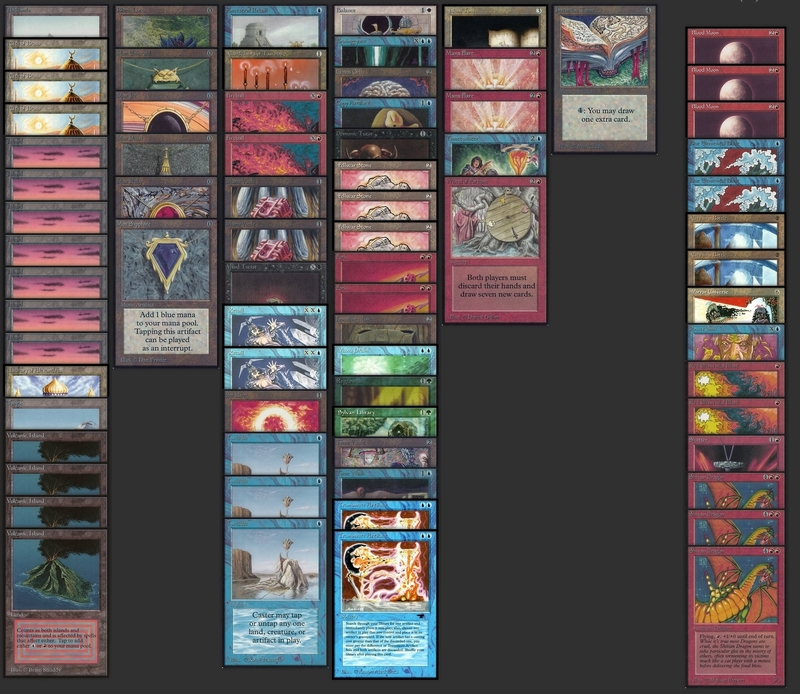 Mostly this list, which I played at a small gathering the day before Grand Prix Stockholm this past weekend. So I want to cut some Howlings. Another idea I’ve been keeping in the back of my mind is a Blood Moon-powered combo deck, being heavy red with a bunch of islands, using the Moon to buy time and disrupt control. This should in theory work well with the heavy red mana requirements of the Fork deck. I did something I rarely do: I brewed in physical space. Spreading out the various combo parts I was considering, I went to work. A small Candleflare component could also work here, also defended by Moon making giving opponents mana less dangerous, and allowing for more ways of generating the mana for a large Fireball + Fork. Another option was a small Twiddlevault hybrid package, like a Time Vault and three Twiddles. In the end, what had to go was the disruption. No Counterspells of any kind here besides the Mana Drain. The deck is still no killer. It’s worse than several other combo decks, I think, not to mention the real tier 1 decks like The Deck and Atog. But it’s sure fun. And the raw power level is high. 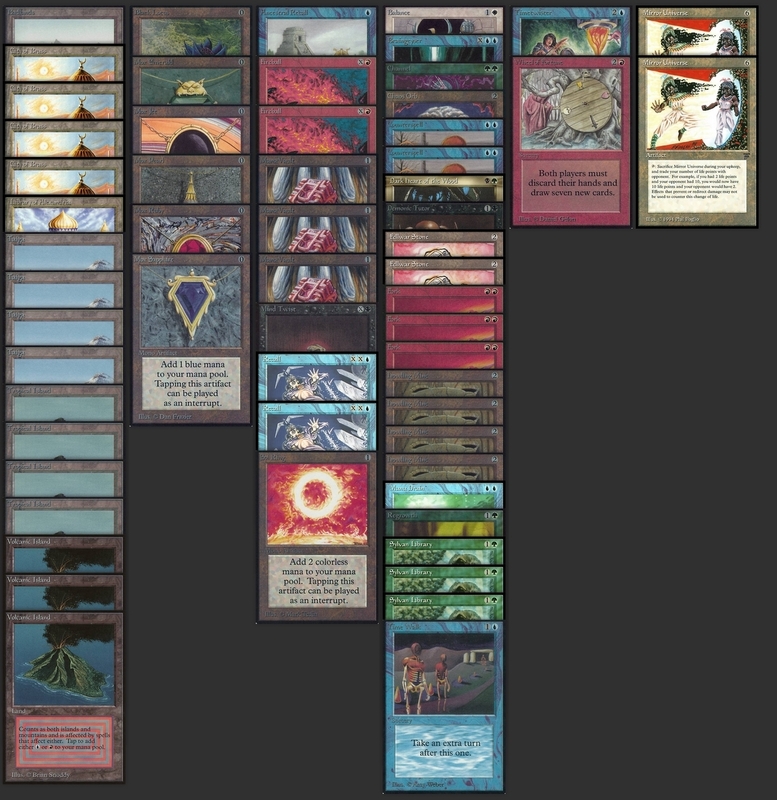 Having access to Blood Moon and City in a Bottle along with the Shivans might mean this has a better board plan than most other combo decks in the format. The main problem is the lack of interaction or threats against real control or highly disruptive decks, like UR with Counterspells and tons of blasts. Especially with the current board. But that’s a gamble maybe worth taking. Another build would probably cut the Candleflare package for Counterspells and try to fit in Mana Short in the board, for example. Now it’s time to experiment with some Lich, I think. If anything interesting turns up I’ll be sure to write about it. See you around. Nice one, like the aspect of trying to go off the turn before you die. Now try this this extreme TwiddleVault! If multiple “extra turn” effects resolve in the same turn, take them in the reverse of the order that the effects resolved.